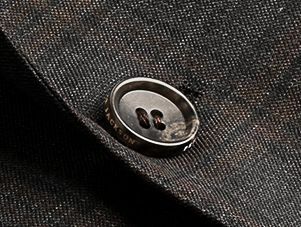 The Brad Charcoal Brown Check is a great addition to any wardrobe due to its mix of highlight and versatility. The cloth has a subtle brown overcheck and is cut in a slim and neat profile; the shoulder is narrow while tapered trousers feature a mid-high rise waist. 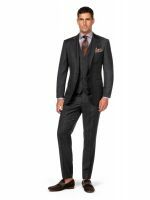 The jacket is fully lined with a half canvas chest piece, for a natural drape and is completed with a pick-stitched peak lapel and duel vent back for comfort. Trouser: Drop 12 with a medium rise. E.g. 100cm Jacket, 88cm Trouser.